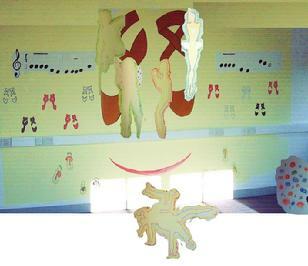 The murals designs for OPEN Ealing's dance studio were created during August of 2011 effectively closing a 'gap' for MaKing Murals. The last mural production had been for Central and Cecil Housing in 1999, after which mural making was put on the shelf as Isabella's role as expectant (again!) Mother took priority. It was a fair reward for her to have some of her children assisting in the OPEN Ealing 'Magic of Dance' mural production, along with their friends. We hope that you take much pleasure and inspiration from the artwork created. One of Isabella's regular sayings is 'Life is Art', it is also for sharing. With her mural painting arm well' oiled' now Isabella is open to designing and producing/co-producing more! 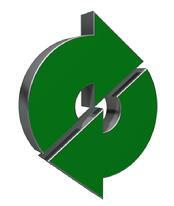 *email address and phone numbers are at the bottom of this page. Michael Jackson & Fred Astaire poses.. eternal dance! Musical notes were included from the tunes 'Chatter with the Angels' (on main wall) and 'Who Built the Ark?' (on windows), Both were selected for their significance in the early stages of playing a recorder, yet symbolically represent the first steps of learning to dance. Chatter with the Angels - perhaps we find our inner courage and strength to believe in ourselves through hopes, prayers, dreams. Who Built the Ark? - In a sense the current building that hosts OPEN Ealing (and so many varieties of art) is like an ark. This is meant in a symbolic way, because the more teachers of arts step into the building to share their skills, the more people can learn and know the benefits of being artistic.. whether performing, creative, digital arts, etc. Art cannot be contained as one generic of activity, it is a host of plenty. A2 Dominion for their support and encouragement.